Healthy and thriving goldfish are a source of great joy, pleasure, and pride. It is the result of research and dedication, hard work and compassion. The advanced goldfish keeper does not stop there, however. Anticipating future trouble and researching new topics and techniques is not only enlightening, it also helps to ensure the continued well-being of your goldfish. There is always more to learn. The knowledge offered on this page describes some of the more advanced and sophisticated aspects of fishkeeping. When you advance as a caretaker, you will no doubt come across new terms and various kinds of equipment with which you were previously unfamiliar. This section is meant to give you an understanding of these advanced topics as well as a deeper and more thorough understanding of basic concepts. It should be pointed out that although the information offered in the Basic Care section provides an excellent starting point, and although a fishkeeper could be very successful with a mastery of that knowledge alone, it is still a wise idea to continuously familiarize yourself with new breakthroughs as well as develop a good working knowledge of the various resources available to you. If you have not yet read Basic Care, please do so before you examine the Advanced Care Section. Unless you have read and understood the concepts there presented, much of the information on this page will be difficult to grasp. Although tanks come in many different sizes and shapes, the standard rectangular tank is still the best. Stay away from novelty tanks and weird shapes. Those are not always built with the best interests of goldfish in mind. For example, a spheroid tank may look attractive, but in the end, the surface area is seriously limited. A hexagonal tank has more corners, and may be more difficult to maintain. The same is true of a tank that is too deep or tall. Can you easilly reach the bottom for cleanings? Does the coffee-table tank let in enough oxygen? Can you attach a filter? Perhaps the worst I've ever seen is a grandfather clock fishtank. It was tall and impossible to clean. It had almost no surface area. There was no place to place an airhose or pump. The standard tank has been produced and reproduced many times. Improvements have been made over the years. A novelty tank does not have this track record of reliability. The serious fishkeeper wants what is best for the fish, not what looks attractive with the wall paper. Ancient tanks were glass with metal frames. With the invention of stronger adhesives, the metal framed tank became less popular. Although the metal-framed tank can hold fish, any such tank should be carefully examined for rust or leaks before introducing fish. If you happen upon such a tank, it is likely of great age, and should be treated with the appropriate cautions. Even when selecting a standard rectangular tank (which allows the best possible surface area) there are some things that should be kept in mind. First, it is a good idea to choose a large tank. Second, it is important that the tank is able to withstand the weight of the water inside it. The deciding factor between a high-quality tank and a low-quality tank is in the thickness of the glass. Your tank is worth nothing if it should burst. Shop around and compare glass thickness for your desired size. (Perfecto makes a good tank). Large tanks (more than 48 inches long) should also have a stress bar across its center to help compensate for the water's tendancy to push apart the walls of the tank. Very large tanks will have more than one stress bar. Finally, if you ever discover that your tank has developed a leak, it is possible to obtain some aquarium sealant at your local pet store with which you can make repairs. The fact is that you will need a large tank to keep your goldfish in. For common goldfish or comets, a 55 gallon is optimum (it will hold about 2 or 3 fully grown fish). For smaller varieties, a 30 gallon for 2 or 3 will suffice. It is perhaps better to obtain a large living space for your fish from the start rather than waiting for them to outgrow a small tank before making a transition. Goldfish grow quickly, especially when cared for well, and they will need as much space as you can provide. A small tank or fishbowl does not provide as much space, and can sometimes stunt the growth of goldfish or cause other developmental problems. In a large tank, they will live longer, happier lives, and grow to their full potential. It is also possible to calculate the capacity of your tank. Hoods help to keep your tank's temperature more even, slow evaporation, and prevent your fish from jumping out. The hood is also used to house the aquarium's lighting. Incandescent : This kind of lighting is more common in smaller tanks. Incandescent lighting produces more heat and cost more in electricity to operate. It is less expensive to purchase, however. Florescent : Florescents cost a little more initially, but they also last longer, run cooler, and use less electricity. It is also a much better choice if you wish to have plants in your aquarium. Eight to 10 hours of intense light is suggested per day. A tank 15 inches high or less should have about 20 watts of florescent for every 12 inches of tank length. Deeper tanks will need more light in order to penetrate through the water to the bottom. Lighting can also be operated by way of an automatic timer. You will be guaranteed in this way that the lights will go out and come on at the same time every day. Dimmer switches can also be included as a way to ensure that the activation of your tank lighting is more gradual. Providing a planted tank or other hiding places gives your fish a place to go if they are startled by the sudden arrival of strong light. The weekly partial water change is the primary method of ensuring good water quality for your goldfish. There are some additional factors to consider, however, if you wish to more thoroughly understand the best conditions in which to keep your goldfish. pH : This is a measure of the acidity or alkalinity of your fish's water. Ph is given in a range of 0 to 14 where 0 is very acidic, 7 is neutral, and 14 is very alkaline. When water comes straight out of the tap, it is usually close to neutral or mildly alkaline (exact values differ based on your geographic location). A sudden change in pH is detrimental to your fish, and continued exposure to high or low pH is likewise harmful. Goldfish thrive at the 7.2 - 7.6 range. Goldfish are able to withstand variations in pH much better than other fish, but even so, an effort should be made to maintain their water in this 7.2 - 7.6 range. Over time, an established tank will begin more acidic, and therefore the optimum needs of your goldfish will no longer be served. Simply continue partial water changes on a regular basis to alleviate this difficulty. Over time, the water in your tank will become more acidic. Being aware of this and doing partial water changes is generally all that is needed to maintain the pH. Ammonia (NH3/NH4+) : Ammonia is dangerous to your fish in even small concentrations. Every effort should be made to keep this, the most dangerous aquarium chemical, at as low a concentration as possible. Concentrations as low as 2 parts per million have been shown to be deadly to fish, and concentrations only marginally higher can prove disasterous for your entire tank. The optimum level for ammonia in a tank is 0 ppm. To combat the rise of ammonia, it is important to know where it comes from. Ammonia is the natural by-product of your aquarium's life functions. Specifically, ammonia is produced and released by your fish. Ammonia is also produced by the breakdown of fish waste, uneaten food, decaying plant matter, and dead fish. Routine maintainance of your tank ensures that no uneaten food or decaying matter is left to rot in your tank. Water changes do the rest. The more fish you have in a tank, the higher the concentrations of ammonia will be and the faster they will rise! This is another incentive to having a large tank. A tank will, over several months, begin to develop beneficial bacteria (Nitrosomonas) which will automatically break down this toxic ammonia into the somewhat less toxic nitrite. This process, however, is usually not sufficient to eliminate all of the ammonia, although it is of benefit. Using this beneficial bacteria to best advantage can be done by installing a biological filter (see Filters below). A new tank will have developed none of these beneficial bacteria, and this is partly why it is so important to allow your tank to sit for at least 2 weeks before introducing fish (although it can take as many as five weeks for the bacteria to form in significant numbers). If the ammonia levels in a tank are found to be very high, an emergency water change may be needed. This water change may need to be as much as 80% in extreme situations if the fish are in immediate danger of being poisoned and killed. The sudden water change will also be stressful to the fish, but in an extreme situation where ammonia levels have surged, it is safer than leaving them in the polluted water. Ammonia is more dangerous at higher temperatures and is also more dangerous at a higher pH. Nitrite (NO2-) : Ammonia is broken down into nitrite by beneficial bacteria in the aquarium. Next to ammonia, nitrite is the most dangerous of natural aquarium chemicals. It is important to keep nitrite levels as low as possible. Nitrite should be kept below .25 parts per million. A level of 0 ppm is ideal. Nitrite can, in high concentrations, reduce a fish's ability to obtain oxygen. Fish can literally suffocate to death when exposed to high nitrite levels. Nitrite occurs naturally in the aquarium as a result of the denitrification process. When ammonia is broken down, nitrite is a resulting product. Reducing ammonia levels in a tank will often have an effect on nitrite as well. Nitrite is indirectly produced by the breakdown of fish waste, uneaten food, decaying plant matter,or dead fish. Routine maintainance of your tank ensures that no uneaten food or decaying matter is left to rot in your tank. Water changes do the rest. The more fish you have in a tank, the more likely you are to have higher concentrations of nitrite in your tank. Having a large tank or fewer fish or both helps to address this difficulty. Not long after your tank develops its first anti-ammonia bacteria (Nitrosomonas), your tank will begin to develop a second kind of beneficial bacteria, Nitrobacter, which will in turn break down the nitrite into harmless nitrate. Aquarium plants and algae use nitrite as food and they too convert nitrite into harmless nitrate. Usually, these processes are not enough to completely neutralize the nitrite in a tank, and so partial water changes are still needed to compensate for the difference. A biological filter (see below) can be used as well to further benefit from the actions of these beneficial bacteria. Nitrate (NO3-) : This compound is the final step of the denitrification process. It is created when the nitrite in your aquarium has been broken down by beneficial bacteria or by the actions of plants or algae. Nitrate is harmless to goldfish, and there are no known ill effects associated with its presence in the tank. Some aquariasts believe that the presence of nitrate in high concentrations over long periods can inhibit the growth of fish, and so like to keep levels under 40 ppm. This can be done with regular partial water changes. Hardness : Water which has a lot of dissolved minerals in it is called hard water. Water with fewer dissolved minerals is called soft water. Goldfish do well in hard or soft water. Some enthusiasts prefer to keep more delicate varieties in soft water, however. Your local water authority can provide details on the condition of the water in your area. Density : The density refers to the amount of salt present in the water. Goldfish are freshwater fish who live in waters whose salt content is negligible. Goldfish will not survive in salt water for any length of time and are not adapted to do so. Some fishkeepers have found, however, that adding a small amount of salt (about a tablespoon per five gallons) helps to "perk up" a goldfish's immune system. Although opinions differ, it is true that a tiny amount of salt will do no harm to your goldfish. (Use only freshwater aquarium salt for this purpose). Water test kits can be used to keep watch over your aquarium's pH, water hardness, ammonia, nitrite, and nitrate levels. These kits allow you to detect problems before you are able to see them. Test kits are most useful during the time you are setting up your tank, and over the first few months. This is the most critical time, for your tank is not yet established. When it is established and has therefore developed its colonies of beneficial bacteria, testing can be carried out on a less frequent basis. All goldfish can trace their lineage back to the Crucian carp, and from this one fish, over 100 different varieties of goldfish were developed over the centuries. Although these varieties are varied and diverse, all goldfish actually belong to just one species: Carassius auratus. Because of this, all goldfish are somewhat similar in their habits, behavior, and required care. Goldfish have no eyelids, and so will be shocked and stressed if lights are suddenly turned on. It is a good idea to always turn on the room lights first (shielding with a lampshade if the light is very strong). Covering the tank with a towel or blanket may also produce a similar beneficial effect. Fish do sleep every night, and will sleep best when their tank is completely dark, so make sure they receive a good night's sleep every night by turning off their tank lights each night at approximately the same time. Fish who are not allowed to sleep will find ways to rest during the day, but overall, their health may decline as a result of stress. Your goldfish are also very intelligent and will recognize the person who feeds them. Goldfish will show this recognition by greeting you with splashing at the surface of the water. A goldfish will benefit from exercise and play, and so having two goldfish is better than one, as this way, both fish will be able to constantly interact. Note that a goldfish will live happilly alone as well, so if your tank can't handle a second fish because of size constraints, it is better to keep just one in a healthy tank than to risk both fish by putting two in a tank that is too small. Goldfish are also sensitive to bumps and loud noise. The tank should be kept where the fish will be spared from excessive noise or thumping. A fish can be seen to jump around or swim with jerky motions when she becomes frightened. Even tapping on the glass can frighten your goldfish. All of these can cause unwanted stress to your fish, and so should be avoided whenever possible. Of the prepared foods, floating goldfish pellets are perhaps the best. Because they float, the goldfish will not lose track of them as they sink into the gravel. Pellets offer more substance than flakes for less effort. A goldfish will therefore take in less air, and capture more of the food. Finally, it is very easy to remove the uneaten food. It is also suggested that food be soaked in water for a few minutes before it is fed to your goldfish in order to avoid having the food expand later in the fish's stomach (which can sometimes cause swimming trouble). Finally, goldfish can be fed a variety of foods. Variety in a goldfish's diet helps to ensure that she is receiving as many nutrients as possible from as many different sources as possible. Cooked peas or corn are very good so long as the shells are removed. Romaine lettuce is good for them if it is cooked until soft. Goldfish will eat potatos, boiled spinach, or even algae. Live foods such as tubifex worms, brine shrimp, or mosquito larvae can also be fed. Varied foods should be fed in moderation and should be used as a sensible supplement to the regular feeding schedule. As always, excess food should be cleaned out of the tank as soon as possible. There are several different methods of filtration which can be used to keep your aquarium water as pure as possible. Both chemicals and debris must be somehow removed from your aquarium water. A good filtration setup has two or more of these methods in operation at once. No one method is perfect, but even so, each is a powerful tool at your disposal. Mechanical Filtration : Mechanical filtration works by taking debris out of the water. When fish waste, excess food, or dead matter is removed from the water in this way they will not be able to decompose in your tank. Power filters, box filters, sponge filters, and cannister filters are all examples of mechanical filtration. Usually, water is sucked into the filter through an intake tube. Debris is trapped inside the filter, and the clean water is returned to the tank. Mechanical filters often perform chemical filtration as well. Sometimes they also provide biological filtration. Chemical Filtration : Chemical filtration works by removing harmful toxins or chemicals from your tank's water. If chemicals are removed, they pose no threat to your tank. Activated carbon or zeolite are two substances which can be placed in a filter to cause chemical filtration. Chemical filtration will, however, remove medicines from the water as well. Biological Filtration : Biological filtration works by changing harmful toxins into harmless substances. An undergravel filter is perhaps the best way to provide biological filtration. Biological filtration takes many months to set up in any form because the beneficial bacteria (which are an integral part of the process) require a long time to develop in your tank. Plant Filtration : Plant Filtration utilizes aquarium plants and/or algae as a means of converting harmful chemicals into harmless chemicals. The plants are included in the main tank or in a separate plant tank. The plants remove the chemicals from the water and use them as food, and in return, they expel extra oxygen into the water. For this method to be especially effective, the plants must be provided with good florescent lighting, and the plant population should be high. Further, goldfish like to eat plants and uproot them, so allowances must be made for this. Some aquariasts consider it wise to leave one or more aquarium walls covered with algae. This provides some plant filtration as well. Filters are the actual devices that you can obtain to produce the process of filtration in your tank. There are a wide variety of filters available. Some of the most common and popular are listed here. External Box Filter : This filter is a small plastic box which is open on the top and hangs on the outside of your tank. It also has an intake tube which descends into the tank water. Inside is some kind of filter medium, usually a filter cartridge. The water is sucked in through the intake tube and passed through the filter medium (which catches particles and may also remove chemicals). The clean water then flows back into the tank. Occassionally, the filter medium must be removed and replaced. This is easy to do. Also, the external box filter does not take too much valuable swimming space away from your fish. The box filter is available in any size from small to huge. Large tanks will benefit from having one external box filter at each end. It is important to obtain a box filter which is capable of handling your tank. Some models allow you to alter the force of the water flow. Care should be taken where small fish are concerned, for they may not be able to escape the suction of the intake tube. Likewise, fish who are sick will sometimes become trapped on the intake tube because they are too weak to swim away. An external box filter can run on power or on air. The power filter is the stronger of the two, and best suited to the goldfish aquarium. Some box filters also provide biological filtration in some modest form. Although it is not much, it certainly doesn't hurt. Cannister Filter : This power filter is much stronger than the external box filter, and is best for the large tank. This large cannister sits near to the tank, perhaps concealed underneath inside the tank stand. An inlet hose brings water into the cannister from the tank and an outlet hose returns water to the aquarium. Water comes into the cannister where particles are trapped inside the filter medium. Chemicals are also generally removed. Because the flow of water to and from the cannister filter is great, care should be taken to set it up properly. The inlet tube is best situated horizontally near the bottom of the tank where the water is dirtiest. The outlet valve should be positioned horizontally across the top back wall of the tank. Creative positioning may allow you to partially reduce the inflow and thereby slow the current. Cannister filters tend to be expensive, but are a good investment for a large tank. Internal Sponge Filter : This small, cylindrical filter is made to sit underwater inside your tank. It is air-driven and has a filter medium inside. The outside is covered by spongy material. It works by sucking in water through its outer sponge-covering where the water is then cleansed by the filter medium. The water is then returned to the tank. This is not a powerful filter and is not suggested except for tanks containing baby fish or perhaps as a part of a temporary tank. Undergravel Filter : This filter provides a large area for beneficial bacteria to colonize. The undergravel filter consists of a large, plastic plate to which are attached two plastic airlift tubes. The plate is permanantly placed beneath the gravel's surface where it rests upon the tank floor. (This is usually done during setup). Air pumps or power heads are fixed to the undergravel filter's airlift tubes and force the water to flow through them. As a result, waterflow is created through the gravel bed. This oxygenates the entire gravel bed and gives the beneficial bacteria the oxygen they need to grow. Many more beneficial bacteria will grow if an undergravel filter is used than if it is not. Water may flow down into the gravel or up through the gravel depending on the kind of undergravel filter used. Both methods are effective. The undergravel filter is somewhat difficult to install, and even more difficult to service should the need arise. An undergravel filter alone does nothing to remove debris from the water although it will help to eliminate the toxins they produce. An undergravel filter alone is not sufficient to service a goldfish aquarium. Of the many types of filters available, one good compination would be a power filter or canister filter used in conjunction with an undergravel filter. A power filter would be able to remove a reasonable amount of debris from the water and would also remove chemicals by means of its filter cartridge (chemical filtration). The undergravel filter could be installed where, once functional, it could convert any remaining toxins into harmless substances. It is usually a good idea to obtain a pump which is slightly larger than the suggested size for your tank. This will allow you a healthy surplus of air which gives you the option to transfer the pump to a larger tank in the future if desired. There is no such thing as "too much air" in your aquarium... so long as the fish are not fighting to stay stable in the water's current, you need not worry about too much air. Air flow can be reduced by poking holes in the airline tubing with a pin or by obtaining a bleed-valve. The action of the pump allows better water circulation in your tank than can be produced by a filter alone. As the water circulates, the water surface is continually renewed and recharged with oxygen. Also, carbon dioxide is automatically released into the atmosphere when the water reaches the surface. The stronger the pump, the faster the water turnover rate. Although a pump does increase the amount of oxygen in the tank, this does not mean that the number of fish should be increased. If the pump were ever to fail, the oxygen ratio would return to its previous state and suffocation could occur. A large airstone will provide a better-distributed flow of bubbles and can also be buried in the gravel. Completely burying the airstone, however, is not suggested as it reduces the density of the bubble stream. Finally, it should be mentioned that the air pump will take any harmful toxins that may be in the air (such as cigarette smoke or painting fumes) and pump them into your tank. If you are planning a painting project in the room where your tank is located, be sure to disconnect the pump during the time that fumes are present in the room. Generally, heaters are not needed in the coldwater goldfish tank. Even so, they may be worth some consideration if you live in an area which is very cold. A sudden heating failure could cause temperatures to drop rapidly. 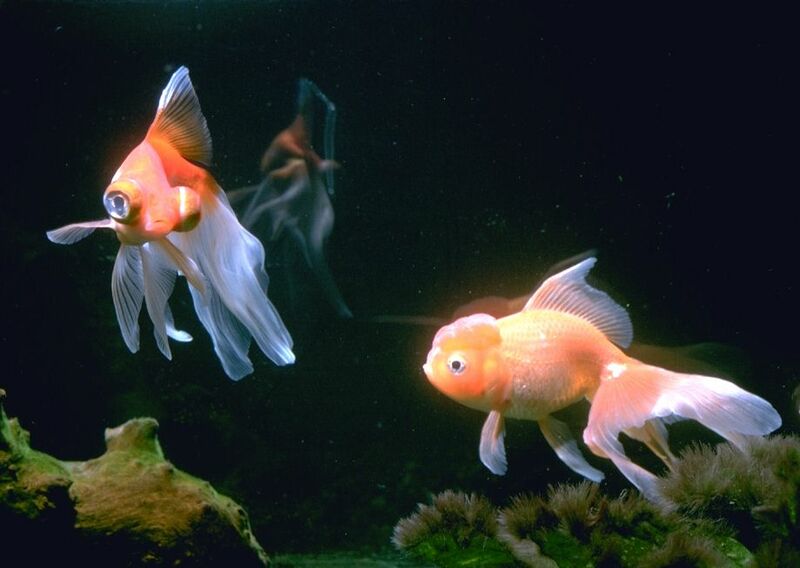 Although goldfish can tolerate low temperatures, a sudden drop is harmful to them. A heater can be used as a safety measure to ensure that temperatures are not allowed to fall below a certain pre-established limit. Ten watts per 1 1/4 gallon is suggested as a guideline for selecting an aquarium heater. A submersible heater may be preferable to one that hangs on the rim. This kind of heater need not be turned off during water changes so long as it is situated in a location that is always under water. It is also completely waterproof. Also, placing it lengthwise will allow the best distribution of heat to the tank. The newest heaters are easier to set than ever before, and include a built-in thermostat. Thermometers are also not generally needed since goldfish live at room temperature. Even so, a thermometer may be useful in case of emergencies or as an aid in keeping temperatures cooler in summer. The small adhesive variety of thermometer is preferable to the free-floating kind because of its inexpensive cost, its unobtrusive size, and because it cannot accidentally be broken. It is also not taking up space in your tank. It is important that gravel (and not crushed coral or coral sand) be used as a substrate in the goldfish aquarium. Coral and shells are calcium-rich, and this ultimately means that they will encourage to pH to rise to unsuitable levels. Gravel serves an "invisible" function in the goldfish aquarium as well. The gravel bed is the safehaven of your tank's colonies of beneficial bacteria. When oxygen content is high in the water, the entire surface of your gravel may become colonized by these beneficial bacteria. This helps to reduce the amount of ammonia and nitrites in your tank, and improves conditions for fish. If your tank is new, there is a method for encouraging this beneficial bacteria to grow even more rapidly. An aquariast need only obtain a small handful of gravel from an established tank (in operation for 6 months or more). This established gravel can be buried just under the surface of your gravel bed, and in effect has introduced the good bacteria at an earlier time than they would normally develop on their own. Over time, they will spread throughout the gravel bed. When a biological filter is in place (see filters above) oxygen is provided throughout the gravel, allowing them to colonize an even greater area for an even more beneficial effect. Your tank should have some shelter for your fish in case they want to hide. Goldfish are not shy fish, but hiding places will go a long way in making your fish feel more secure as well as providing a shelter from the shock of bright light when your aquarium lights are turned on. Sharp decorations should naturally be avoided, especially where fancy varieties are kept. A fish could harm itself if it is allowed to run into a dangerous protrusion. Fish with hoods, protruding eyes, or water sacs are especially at risk. Beneficial bacteria will also colonize the surfaces of decorations in your tank. If possible, and especially if you do not live nearby a fishstore, you might consider obtaining a few emergency supplies such as some extra airline tubing, broad-spectrum medications, a spare tank, a spare airpump, clean clear plastic bags (for catching goldfish), airstone, dechlorinator, reference book, and/or filter cartridges. If there is ever an emergency, these items may come in handy. A final word on chemicals: the aspiring hobbyist will soon discover that chemicals can be purchased for any number of things: destroying algae, softening water, keeping the pH stable, adding bacteria, neutralizing ammonia and any number of other things. While each of these products may have their proper use, it is suggested that the aquariast stay away from excess use of chemicals whenever possible. Although these chemicals have been tested to determine their levels of safety for the aquarium, the full effects cannot be known, nor can the effects of their interaction be known. Some substances are harmful to the beneficial bacteria or plants in your tank even if they do not directly affect your fish. Further, there are usually natural ways to duplicate the effects of many of these products. So, unless you are treating a problem, or unless your local water supply is simply not suitable for fish without treatment, it is generally better to leave well enough alone. Photograph goldie.htm was provided by Erik Olsen of the GSAS. Used with permission.